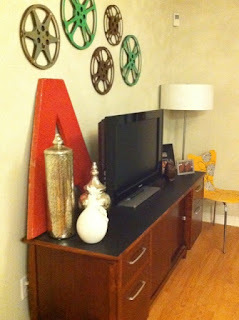 I **finally** hung my vintage film reels because Harley seemed to be attracted to that area of the room. She tripped over them one too many times and I was feeling like a terrible dog owner. I tend to let things sit until I am 110% sure that I love them, so at least I now know they are keepers. Now I know that I am not painting that wall again!